As he was speaking, a revolution was brewing under his feet. New methods of producing gas from unconventional resources–tight gas, coalbed methane (cbm) and shale gas–had greatly expanded the universe of gas resources available throughout the world. By the end of that decade, the U.S., Australia and Canada would be able to book unconventional reserve additions in excess of annual production from all gas sources. So dynamic has been the process of conversion of unconventional resources into reserves for the three onshore options that unconventional gas production in 2010 accounts for about half of the US gas output and about 15% of Australia’s gas output. With output from traditional gas fields in North America declining it was believed that only vast imports of LNG, as much as 80 million tonnes per annum (mtpa), by some estimates, could meet the ongoing demand from the US. With imminent “shortages” on the horizon the general consensus was that the era of abundant hydrocarbon supply for the US was over. The alarm about US supplies was augmented with concern that Canada could no longer step in as a reliable supplier for the northern tier states. What changed the North American supply picture, even as the worries about gas output reached a crescendo in 2005-2008, was the growing ability to produce gas from difficult geological structures at reasonable costs. The first of the unconventional resources to enter major production was tight gas. The key that unlocked this gas was hydraulic fracturing – pumping a water-sand mixture into the formation at very high pressures. So successful was this “fracking” that tight gas output has risen to roughly 25% of US gas production, about 5.2 tcf/y. Indeed, tight gas (see Figure 1) is no longer classified by the US Department of Energy (DOE) as unconventional. Even more important, the US service industry has learned to employ fracking as an ordinary, and quite cost effective tool. A strong support system of contractors, equipment suppliers, engineers and banks has developed in the US around fracking activities. Without unconventional production U.S. gas output might be as low as 60% of current output, about 12–13 tcf. As the maps of US unconventional gas clearly demonstrate, all three sources of new gas – tight formations, coalbed methane and shale gas – are found in roughly the same locales. The implications for integration of these reserves into the US gas transmission system are extremely favorable for the timely and cost-effective development of the unconventional sources. 3. By developing the “easiest” unconventional resource first – tight gas in the US and Coal Seam Gas (CSG) in Australia, the marginal costs of developing the next unconventional resource in line are reduced, generating significant benefits for developers and consumers. Fig. 1: Tight Gas Plays in U.S. The second leg of the unconventional triad was coalbed methane (see Figure 2). This resource, first noted in the 1980s in coal producing areas of the US, presented few technical issues, save water disposal. CBM generally is found at shallow depths and features natural reservoirs and traps. The conversion of the resource into reserves in the past decade added about 8% to US gas reserves during the 2000-2010 period. Production from coalbeds accounts for a similar share of US gas output (see Table 1) just under 2 tcf. Fig. 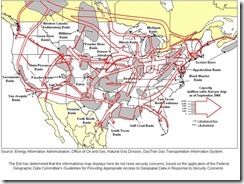 2: Coalbed Methane Fields in U.S. The final, and perhaps most significant element in the revival of the U.S. gas market was the application of fracking to shale formations at depths greater than 5000 feet (1.75 km). These formations, which occur throughout North America (see Figure 3 and Figure 5), now account for more than 10% of US gas production (~2.3 tcf/y), and are expected to level out at 4-5 tcf/y by the middle of this decade. The flattening of output is more a demand side than supply or cost driven event. 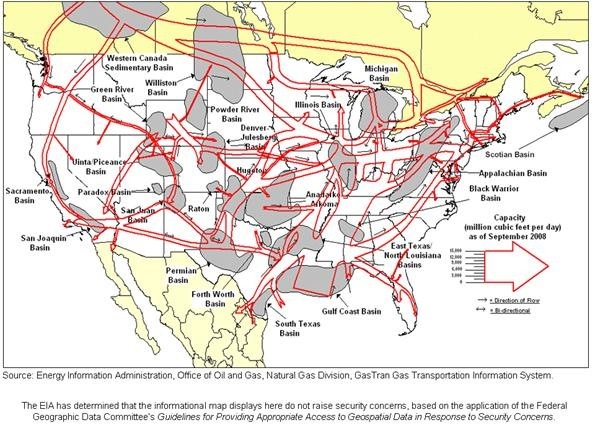 Using the vast US gas pipeline network producers of unconventional gas have been able to seamlessly integrate their output into the market (see Figure 4). Such integration has permitted much faster ramping up of production than might be the case in less flexible or less networked gas markets. In the year since this table was published the US Department of Energy has revised upward its estimate of producible shale resources from ~340 tcf to 823 tcf. 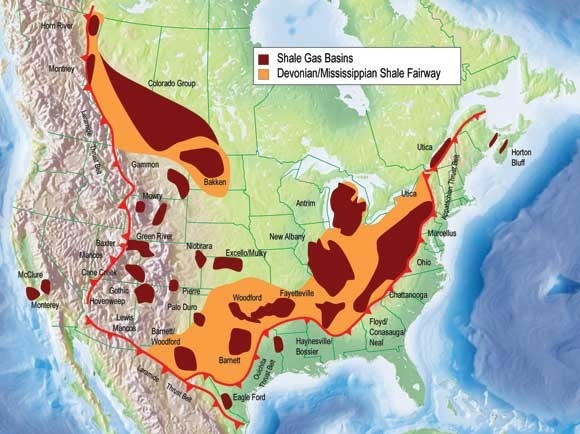 The extensive nature of these shale basins, especially the proximity to major demand centers in the US, has transformed the US gas market. Due to the expectations in the LNG supply industry of large US purchases the unconventional gas revolution has also transformed the Atlantic Basin gas markets (see Section 1.2). What Has Unconventional Gas Meant for Atlantic Basin Gas Markets? In addition to the loss of the US import market for LNG the unconventional gas revolution will turn both the US and Canada into competitors in the LNG markets. At Sabine Pass (Texas-Louisiana) and Freeport (Texas), proposed or operating LNG receiving terminals are adding liquefaction facilities. Total planned LNG export capacities for the Atlantic Basin locations will sum to more than 1.7 bcf/day (~13 mtpa). With prices set at a market hub (Henry Hub in Louisiana), unconventional production in North America has established gas-on-gas competition, cutting the strong link between natural gas and oil prices that has prevailed for years and still sets prices in Europe and Asia. Indeed, the long production life of shale gas in Canada has been seen by investors as sufficient to invest in Gas to Liquids production. In the US shale gas production has led to investment in new gas separation facilities and a revival of moribund petrochemical firms. With two market-based pricing points in the Atlantic, Henry Hub and the UK National Balancing Point, price discovery for LNG buyers is no longer shrouded in mystery. Moreover, both buyers and sellers can use these markets to hedge risk in gas supply. The strong physical value chain that has for so long characterized LNG transactions has been broken. Today, an LNG supplier to a US or UK customer has the option of making the physical delivery or, if prices are more advantageous, purchasing the gas in the domestic market for supply to the customer and selling the LNG elsewhere. While these new market instruments are fully available only to US and UK gas customers and suppliers, the increased supply, improved transparency and additional flexibility have combined to put pressure on prices throughout the Atlantic Basin. Lower cost gas has opened up new markets for LNG – Dominican Republic, Jamaica, Honduras, El Salvador and Brazil, among others. Indeed, the increased flexibility and capability of the entire supply chain has made supply to smaller markets far more cost effective than previously. Even where markets in gas hardly function, the impact of unconventional US production has still resulted in lower prices and more flexible supply terms. For example, a number of Russia’s gas customers have increased their purchases of attractively priced spot market LNG, putting pressure on Gazprom to reduce pipeline export prices, which they have done. By making LNG more affordable throughout the Atlantic Basin the unconventional gas revolution has exposed regional pipeline and LNG exporters – Nigeria, Algeria, Egypt, and others) to increasing price competition. Overall, the cost-effective production of unconventional gas in the US has changed the calculus of the gas value chain, making domestic uses far more cost effective, especially as substitutes for refined oil products in heating, transportation and industry. A likely next step for natural gas in North America is further penetration of power generation. With about 23% of the US generation market already, natural gas is poised to take additional market share from coal as older coal-fired plants retire in this decade and are replaced by cleaner gas-fired plants. The projected total uptake in the power sector could be as much as 4-5 tcf/y, leaving more than 22 tcf/y available for other uses. Is Gas-to-Gas Competition Here to Stay in the Atlantic Basin? It is tempting to dismiss unconventional gas as the “next great thing,” – the “fuel of the future and always will be.” However, the speed of reserve growth in the US and Canada, and the parade of potential new producers in Poland, Netherlands, UK and Ukraine point to a long-term trend. The impacts on market prices have been profound. The conversion of resources to reserves in the US, now running at an annual rate of more than 20 tcf/y, results in a steadily rising gas reserve ratio for the US (and for Canada), even as production goes up. Though not as well explored as the US, producible shale gas resources in Europe are estimated to exceed 500 tcf. Drilling programs are active in several countries, including France, Hungary and Poland. Analyses of LNG netbacks demonstrate repeatedly that the price pressure exerted by unconventional gas production in the US and Canada is on the order of $3-5/mmbtu. The impacts on prices indicate that even at relatively low levels of production unconventional gas can move market prices a great deal. The net reduction in LNG imports to the US compared with the predicted levels – the basis for strong LNG prices prior to mid-2007 – was just 0.6-0.7 tcf on an annualized basis. In other words, an reduction in US LNG demand equivalent to about 3% in US supply was sufficient to wreak havoc on Atlantic Basin markets. With producible resources of several hundred tcf, shale production rates in Europe could achieve 1-2 tcf/y of output. Such production would represent more than 10 and as much as 25% of what Europe currently purchases from Russia, and 5-10% of overall consumption in Europe. Already, those European countries with active natural gas markets pay far less for LNG and pipeline supplies than those continuing to purchase LNG. Algerian netbacks for LNG sales to Spain are $1.50/mmbtu higher than for the UK market and more than $6.00/mmbtu greater than netbacks to Everett (US). For most of 2010 the UK netbacks were more than $2/mmbtu below those of Spain for Algerian or Nigerian gas exports. Over the next 20 years the production of unconventional gas will continue to grab market share in the Atlantic Basin. Projections from the US Department of Energy indicate expected shale gas production of more than 10 tcf by 2035 will offset any expected declines in conventional gas production, with overall US gas output rising to about 26 tcf by 2035 (see Figure 6). Source: US DOE, Annual Energy Outlook 2011, Preliminary, page 1. Based solely on US and Canadian output of unconventional natural gas, gas-on-gas competition in the Atlantic Basin will remain a dominant force in price determination. With some output expected from the Netherlands, Poland, France, Ukraine and others, companies exporting to the Atlantic Basin cannot expect oil-linked premiums. Not all of that gas will be salable in Asian markets at premium prices eithers. Though late to the game Asia’s role in unconventional gas may be just as dramatic as North America’s. This theme is explored in Part 2 of this post. Current US production is about 22.5 tcf/y. See AEO 2011, Early Release Overview, 2010, page 8. This figure is not the same as proved reserves, but represents resources that are producible with current economic and technical conditions. One estimate of the savings to Mexico due to the “shale gas effect” is about $10-11 billion annually in comparison with oil-linked LNG supply contracts (see http://www.gartenrothkopf.com/gr-energy-climate-briefs/foreign-investment-in-us-shale-plays-earning-while-learning.html). The impact on LNG cargo prices, as seen in the Oil and Gas Journal, is $4-5/mmbtu (see http://ogjresearch.stores.yahoo.net/lngneprwda3t.html). Qatar is excluded from this list. It is understood that the very low costs of production from that emirate’s North Field can withstand wellhead netback values under $1.00/mmbtu, well below other LNG competitors. The Energy Information Administration of the US Department of Energy notes that shale gas reserves growth has exceeded total US gas production from all sources since 2008. See Steven Holdich, “How Technology Transfer Will Expand the Development of Unconventional Gas Worldwide,” Lezig, Netherlands, 2009. Holdich uses a figure of 509 tcf for Western Europe. See any issue of the Oil and Gas Journal over the past two years, for LNG netbacks. Another good piece. Thanks. I have heard a rumor that fracking in France has been halted pending an investigation on environmental efficacy. Any truth to this or is this another bit of environmentalism gone wild similar to the charges in NY and Penn. Continental Europe lacks the upstream infrastructure, both hard and soft, that has propelled US unconventionals. Their rules for fracking are not well developed, and yes, there is a bit of excess caution in the overall approach. Look for the highly motivated countries – Poland, Ukraine, Romania, all highly and uncomfortably dependent on Russian Gas – to lead the way. A very helpful article. My compliments to MasterResource as well. You are growing into an excellent source of energy information. It’s kind of funny the way the whole “knowledge problem” intrudes on predictions by our best and brightest. Who would have though that the resources invested in building LNG terminals to receive gas, might become the basis (with some additional investment) to export same. Based on my experience in the transportation business, I’ve never been persuaded that there’s much of a future in using natural gas to power vehicles. However, compared to the challenges of electrifying fleets, natural gas power looks pretty close to a lay down. There are certainly tens of thousands of inter city fleets that could be converted, natural gas power has been used for decades in oil field applications. So, unlike battery power it’s not like we have to create something new. It’s more a matter of cost/benefit ratios leading fleet operators to investment in the infrastructure and figuring out methods to make filling up with natural gas as painless as filling up with gasoline. On the other hand, I don’t put much credence in the Picken’s Plan. It borders on impossible to convert class 8 over the road trucks in a manner that would be efficient. Losing the flexibility of the current operating methods of the over the road tractor fleet is a huge hurdle to practicality. Thanks for the comments. I agree that heavy truck conversions are not wise, nor are they likely (sorry, T. Boone). However, local fleet conversions, especially for vehicles that return to a central garage every night, can make a lot of sense in terms of cost and emissions; ditto for city buses. Note that the two-way LNG plants would not be feasible absent the dramatic fall in liquefaction costs. The increasing cost-effectiveness of gas liquefaction has greatly reduced the need for inflexible supply chain contracts from the wellhead to the final consumer. The Port of LA is also using (and making) electric yard trucks, with a ~60 mi. range. This is adequate for local container deliveries as well. Costs and convenience are major gains, as is driver satisfaction (no diesel-smell saturated clothing to wash every day!) Tesla Motors is collaborating with Freightliner on city vans, etc. So both track are happening. If the processing of waste water produced by this method is not a cause for concern, why is it so conspicuously missing from the article? By omiting the facts that an “unkown” chemical mixture is injected and that radioactive elements are also flushed with this process and that this waste must be treated you create unnecessary doubt and suspicion. I do not know if this is “environmentalism gone wild” or an issue of real concern. However, your silence on the issue is deafening .